Disclaimer: Do not attempt to hang Christmas lights when snow or ice is visible on the ground or on the roof, or during wet weather conditions. It is incumbent upon the homeowner, to follow all building codes and safety codes, and to ensure their own safety. It is advisable that only a professional should stand or walk on a roof and only sparingly to avoid the risk of damage to the shingles. Always have someone with you during the entire installation process. In addition, certain medical conditions may make hanging Christmas lights and working at heights a hazardous activity for you. Please exercise all caution and consult with your physician first if advisable. There’s something truly uplifting about driving through your neighborhood while it’s decked out in Christmas lights. If you want your home to contribute to the Christmas spirit, there are plenty of light and style options that you can choose from. Even your choice of gutter shingle light clips can change the look of your holiday display. On the other hand, while you may be excited to see the festive rooftop decor, few homeowners are truly comfortable with installing lights at roof height. To help you, we’ll share our tips on how to hang Christmas lights on your roof safely. You may even be able to put up your Christmas lights without a ladder and get that holiday cheer without stress! Further, there is a lot of misinformation out there about nailing or stapling your lights to the roof. You should never poke a hole in your asphalt shingles, or any other part of your roof, no matter how small. We’ll show you how you can secure Christmas lights to your roof without damaging your shingles. Plus, we also have some tips about how to make your roof light display look lovely, whether your style is traditional, or you prefer rainbow lights in funky patterns. When you’re hanging Christmas lights on a roof, you shouldn’t use any fasteners that puncture the shingle or any other part of the roof, such as nails, staples or screws. Even small holes in the shingles can create leaks. Small holes in gutters may allow water to leak where it shouldn’t, and holes in the fascia board may cause it to rot. If you’re unfamiliar, it’s a good idea to learn about the parts of a roof and roof edge before you put up your Christmas lights. So, if you shouldn’t puncture holes in the shingle, how do you secure Christmas lights to your roof? The solution is to use specialized plastic clips that hug the gutters, but don’t leave a lasting mark. By using clips you can have a huge display, with as many fasteners as you need, without worrying about leaving a bunch of holes in your roof. On areas of the roof that do not have gutters, attach the clips to the drip edge or the shingle, but be careful to avoid lifting the shingles in a way that breaks the sealant bond to the shingle below it, and avoid puncturing holes in your shingles or siding. Alternatively, you can use adhesive strips to attach the clips to the vertical face of your home. Just be sure you don’t puncture the surface. The type of roof edge you have will help determine your choice of clips and rooftop lights. Simple hooks: You simply place the line into these hooks. The clip itself hooks over the edge of your gutters. Clip to the line: These clips also hook onto the line of the lights, but achieve a tight hold. They are best for icicle or rope lights that don’t have bulbs you need to orient. You install them by hooking them over the edge of the gutters. Clip to the bulb: These clips hold onto the bulb itself for maximum precision. They create a neater look because they force all of the bulbs to point the exact same way. You’ll have to match the clip to your bulb size. You’ll also need to decide whether you want your lights pointing up, down or out before you buy. Also, some of these clips don’t allow you to remove the light unless you unscrew the bulb, which takes a lot of work, but does make the light more secure in windy areas. These clips are installed by hooking them onto the gutters or onto your drip edge. Roof peak clips: These clips are most often used by professional Christmas light installers because they require that you get close to the roof’s peak, which can be a challenge. You install these clips by perching them on the peak of the roof. They grip the shingle edge. There are a few other types of Christmas light roof clips that you should avoid in order to protect the integrity of your roof. We recommend that you avoid the clips that tuck under shingles. Hanging lights isn’t worth the risk of lifting your shingles up. You should also avoid deck clips; they are meant for railings and won’t be secure on a roof. Do you prefer the pure color of white LED lights? Or are you a traditionalist who loves the soft, warm glow from incandescent lights? Whichever lights you choose to use on your roof should be rated for outdoor use. Whether you prefer the pure color of white LED light or are a traditionalist who loves the warm glow of incandescent lights, be sure the lights you choose are rated for outdoor use. They should be tested by Intertek (ETL), Underwriters Laboratories (UL) or the Canadian Standards Association (CSA). Incandescent lights are cheaper than LED lights up front, but they use more energy, generate heat and are more of a fire hazard. Their larger energy requirements mean that you’ll only be able to have three to six light strands per outlet, while you’d get many more per outlet if you use LEDs. On the other hand, incandescent lights tend to be brighter on average than LEDs and have a different light quality that feels warmer. Some like the nostalgia of incandescent lights if they grew up when LEDs were not available. LED lights use less energy, which means you’ll spend less on your utility bill, and you’ll be able to power more lights from a single outlet. Few people have more than two outdoor outlets, so LED lights are often your best choice if you want a big Christmas display. Potentially, you could have 25 LED strands on the same outlet, but the specifics will depend on your home and the lights you choose. Not all “white” LED lights have the same hue; some will look bluer, and others will look more yellow. Therefore, it’s important to buy your LED light strings all at the same time, including the backup bulbs, in case the manufacturer changes the hue slightly the next year. Those who have limited outdoor outlets may want to look into battery-operated lights. You should look for a string with a weatherproof battery box. If you can’t find one, then you’ll have to protect the non-weatherproof box from rain and snow. It may also be wise to invest in rechargeable batteries to put in the pack too, as most run on simple double AA batteries that may not last through the season. Now for the fun part! There are many styles of Christmas lights available. Some are relatively new, such as raindrop lights or fairy rope lights. We suggest combining a few different kinds of lights to create the most interesting display. Icicle lights: These are among the most popular lights for rooftops because they mimic the look of glittering icicles. You can buy these lights with various drop lengths and in different colors. If you buy long icicle lights, be sure they won’t interfere with your doors and windows; you don’t want them to get caught. If you can choose only one kind of light, icicle lights are a great choice. Raindrop lights: Raindrop lights are relatively new. Each is like a single icicle. You can use rain drop lights in areas where a whole string of lights would be too much. Or you can pair them together as if they were on a string. Raindrop lights give you the flexibility to light up unique spots on your home. Try putting a few on your mailbox, or below your windows. Mini string lights: Though these are the most popular lights for Christmas trees, they are very subtle on rooftops because they don’t give off much light and the small bulbs do use less energy. Large bulb lights: Just as you imagine, these larger bulbs make a bigger statement and use more energy. Often, they come in unique textures or colors. They even come in unusual shapes, like snowflakes, hearts, or reindeer. These lights are large enough that any pattern they have (such as flashing, chasing or changing color) is obvious from across the street. Wide-angle LED mini lights: For some, LED lights just aren’t bright enough, especially not from the side. The unique shape of these lights is meant to throw the light to the side so that they appear brighter, without using more energy. These lights are a good compromise for those who want a brighter display but don’t want to use too much energy. RGB LED: If you’re trying to match your Christmas roof lights to a wreath, a reindeer statue or another piece of decor, these lights might be the perfect solution. They are programmable so that you can choose your exact shade from 16 million hues. However, some shades, such as brown and pink, are difficult to program with these lights. Rope lights/fairy rope lights: Rope lights are thick plastic tubes with lights embedded into them. The advantage of rope lights is that you can easily wrap them around things or make unique shapes, without having to secure each bulb in place. They’re fun and flexible! You can use them to spell festive greetings on your lawn or to light up your seasonal decor. However, these lights are not very bright because they send off light in every direction. They’re best used as accent lights instead of your main lights. Your rooftop Christmas lights are a great opportunity to show off your sense of style and to create the kind of Christmas atmosphere you want. Everyone walking through your door during the holidays will be looking at the lights. Will they feel like they are stepping into a traditional, comforting Christmas gathering? A winter wonderland in blue? Or perhaps you want them to feel like they’re stepping into a huge gingerbread house? Whatever your style, here are some Christmas light tips to help you achieve it. There’s good news for those who don’t like to be on very tall ladders—you don’t need to add any lights to the second story for your home to look great. This home proves that you don’t need to get up dangerously high, or cover every inch of your roof, to have an impressive Christmas light display. In fact, many homeowners will hang lights or wreaths in their second story windows to tie the look together, instead of putting lights on their roof’s peak. Simplicity is a great choice for your light’s style too. Try using only a single kind of light on your roof. All large bulbs in white are the most traditional look. Some choose to make elaborate roof outlines as their only Christmas lights. This captures the silhouette of the roof and makes it look almost like it’s from a picture-book. Some choose to do simple outlines in a single color. Adding in a few color elements, or perhaps flashing lights, can add some variety. One thing that most great Christmas light displays have in common is that they have a focal point, where the eye is drawn, and use symmetry to make that focal point stand out. The most common focal point is the front door, and, often people will wrap lights on the pillars surrounding their door. Or they will light up the two trees on either side of their front door. Without a focal point, or with too many, a Christmas light roof display can quickly feel overwhelming. Further, some houses are asymmetrical. The architect likely compensated for the imbalance somehow, sometimes even using landscaping to balance both sides of the home. If you don’t similarly balance your roof lights, your display may look odd. How do you balance lights? If you step back from your home and one side looks “fuller” or “heavier” than the other, take something away from the heavy side or add another light feature to the lighter side. This will help balance things out and make your light display look complete. Color is a little controversial in the Christmas roof lights world. While some love to make rainbow displays, others shudder at the thought of using anything but white. If you land somewhere in the middle, how do you keep your displays interesting without going too wild with color? We have a few ideas. If you use a multi-colored strand, use only that strand and make sure the colors are the same hue. Or, use a multi-colored strand and pair it with single colored strands that match one of the other colors exactly. For example, you could pair a purple, orange and blue strand with a second kind of strand that is only blue. You can’t go wrong with white, red and green Christmas lights. If you want to include a non-traditional color, like orange, purple or pink, do so sparingly. Opinions on blue are mixed — some think it’s traditional and others don’t. Remember, in the end, you should make it look however you want – it’s your roof! After you have a rough idea of which lights you’ll put where, you’ll need to measure your roof. That way, you’ll know exactly how many light strings you’ll need to buy. If you’re not used to working on ladders, you should learn about ladder safety before you start, because you’ll need to use a ladder to measure the roof. Extension ladders can position you higher if a regular ladder isn’t enough. Alternatively you can guesstimate the size of your roof and buy more lights than you need. Extra lights can usually be returned to the store during the season. Also, remember that having too many lights powered by one outlet can be a safety hazard. Take the time now to plan out which lights will use which outlets. If you are not sure how many lights can be safely powered by your outlets, consult an electrician. Once you’ve purchased your lights, you should turn them on for an hour or so to be sure there’s no damaged or burnt-out bulb. It’s much harder to replace bulbs when the lights are already on the roof. Tape to secure the cords to the ground. Disclaimer: Hundreds of accidents occur from hanging Christmas lights each year. Always have someone with you during the entire installation process. 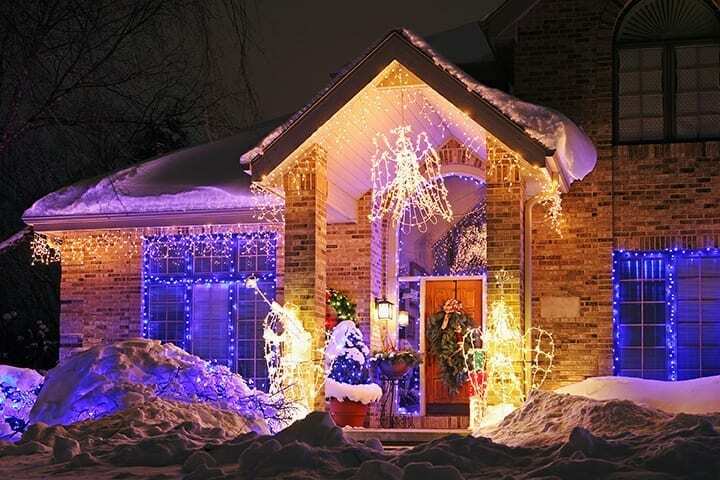 Never hang lights if there is visible snow or ice on the ground or roof, or during wet weather conditions. Always follow local building codes, safety codes and ladder safety. Home improvement stores carry accessories for personal ladder safety as well as accessories to prevent ladder damage to the home. Step One: Always have an assistant with you while hanging lights — trust us you’ll need one. Before you get on the ladder, attach the first few clips to the bulb or cord (depending on which kind of clips you purchased). It is easier to work with a short string, so don’t connect the next string until you have run out of line. Step Two: Locate the power outlet, attach your extension cords, and start from whichever part of the roof is closest to the outlet. That way, you know the cords will reach the outlet. But don’t turn the lights on until you have hung them as they can get very hot. Step Three: Position and carefully climb the ladder. Attach the clips to the gutters with one hand, so that you always maintain three points of contact with the ladder. If a clip comes loose, have your assistant fix it. Step Four: Keep the clips close enough together so that the line is taut and straight, especially if you’re installing icicle lights. This will ensure the lights match the roof line exactly. Step Five: Work along the roof, taking care never to reach so far that you’re shifting your center of gravity off the ladder. Move the ladder frequently. Step Six: Only add more clips or another string when you’re on solid ground, so you can work with both hands. Step Seven: If you reach a roof edge that does not have gutters, like a gable edge, attach the clip carefully to the drip edge or shingle. Never puncture any part of the roof with staples or nails. Step Eight: If you need to reach higher, you have several options. You can use a taller ladder, or a light-hanging pole, or rent special equipment, like a bucket lift. Never stand or walk on the roof. There are a few ways to hang Christmas lights without a ladder. The first is a simple solution, a light- hanging pole. To use these poles, you attach the clip to the lights then place the clip in the pole’s grip. Then, you simply extend the arm and hook the clip over the gutter. If you find this method too frustrating, or your roof is too high for the pole to reach, you can rent a bucket lift to get you up there safely without a ladder. The rental costs often aren’t as expensive as you expect, but, you’d need to rent it to take the lights down too. Sometimes a bucket lift is the only way to get to the peak of high-pitched roofs safely. Those who are deeply uncomfortable on ladders or at heights may prefer to hire someone to put up their Christmas lights. Be sure to choose a legitimate company that specializes in Christmas lights, follows safety protocol on your roof and has insurance. The last thing you’d want is to be responsible if your installers fell or hurt themselves. You may be able to find a roofing contractor who will hang your lights for a fee. Use our Contractor Locator tool to find a contractor in your area. While some people like to keep their lights up all year, the sun may actually fade their color. In fact, if one side of your house has more light exposure than the other side, your Christmas lights may even fade unevenly, affecting the overall appearance of your holiday display. When you take down your lights, you shouldn’t just pull on the string. While it saves you time, it may pull down your gutters and otherwise damage your asphalt shingled roof. Instead, take down your lights the same way you put them up, carefully, safely and one clip at a time. You should also be conscious about how you wrap the light strings. If they twist, they may kink and look odd next year, especially if you use clips that hook to the line instead of to the bulb. Christmas roof lights are a special part of the holidays for many of us here at IKO. When we get to show off our roofs and spread holiday cheer, well, that’s a win-win! We hope you and your family enjoy your lights and the whole holiday season, safely. By the way, if you notice a problem with your asphalt shingles while you’re installing Christmas lights on your roof, you can use our Contractor Locator to find a roofing professional who can advise you.